A friend of mine recently took me through the playlist he likes to use when he runs. It was mostly hip-hop and radio-friendly guitar rock, but he said his main criteria was to pick tracks that were consistently up-tempo and aggressive. 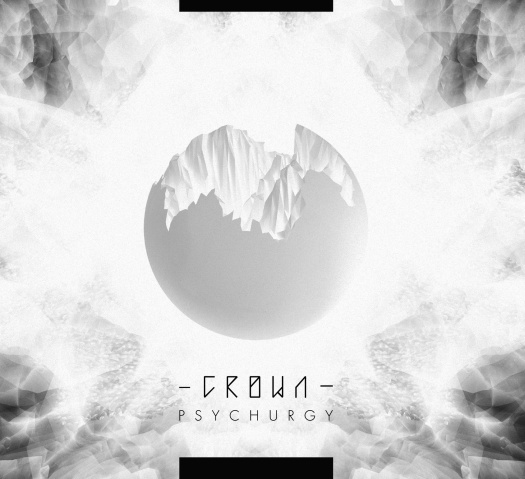 I think Crown's first full-length, Psychurgy, achieves that kind of focus of purpose, but this isn't music you would listen to while running or lifting weights. If your workout routine involves slowly and methodically punching boulders into pieces, then Crown has the playlist for you. Aside from two interstitial pieces ("Kynesyk I and II"), the album is unrelentingly thundering and heavy. They have a song called "We Will Crush the Open Sky," and I don't think that's a metaphor. The music is a mix of doom, industrial, and drone that would be perfectly at home on a playlist with Jesu. The band's two members are both guitarists, leaving the drumming to a capably programmed drum machine, but the real draw is the melodic-yet-glacial melodies they create. The music sounds like it was composed to pull down mountains, but there are still stick-in-your-head melodic hooks, like the mournful figure that weaves through the track "Serpents and Fire." Vocals come as satisfying growls and "cleans," at least of a sort. The vocals are often treated with different electronic effects, adding a nice bit of variety, although in a couple of places, I found the vocal effects to be a bit too heavy-handed. The otherwise excellent track "We Will Crush the Open Sky" gets off to a rocky start with vocals that are so flattened and altered that they sound a bit like Stephen Hawking's vocal synthesizer, but this is a rare misstep on an otherwise fantastic album. The fact that the duo have only been a band since 2011, and the fact that they've released an EP, a split, and a full-length of such high quality in such a short time makes me very excited to hear what they'll do in the future.